Initially created to reduce the symptoms of epilepsy, the ketogenic diet is now one of the hottest fads in the wellness community. This high-fat, low-carb diet has been shown to benefit not only mental wellbeing, but also boost weight loss, improve diabetes symptoms, and even prevent cancer. One of the easiest ways to live a keto lifestyle is to use a slow cooker to make your meals for you. Below, we’ll go over 28 delicious keto meals you can easily prepare in the crockpot. This recipe has “comfort food” written all over it. Put diced chicken thighs in your crockpot along with chicken stock, heavy cream, spinach, carrots, celery, garlic, and onion. For a fresh from the garden flavor, season liberally with Italian herbs like thyme, oregano, and rosemary. Within only four hours on low, you’ll have creamy dinner that’s ideal for cooler months. Chicken moleis one of Mexico’s signature dishes, so it’s well worth the effort to find authentic ingredients for this recipe. In particular, don’t skimp on the New Mexico chili peppers. The blend of the almond butter, dark chocolate, and peppers give this dish a unique smoky flavor that’s very different from most Americanized Mexican cuisine. Traditional Zuppa Toscana heavily relies on diced potatoes, which is a big no-no for keto dieters. 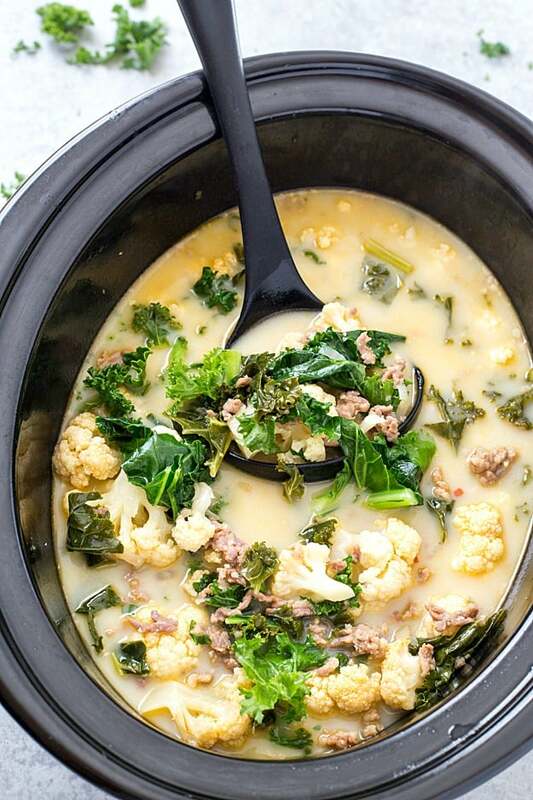 People on a low-carb diet can, however, still enjoy the flavor of Zuppa Toscana sans potatoes. All you have to do is replace the potatoes with a fresh head of cauliflower. 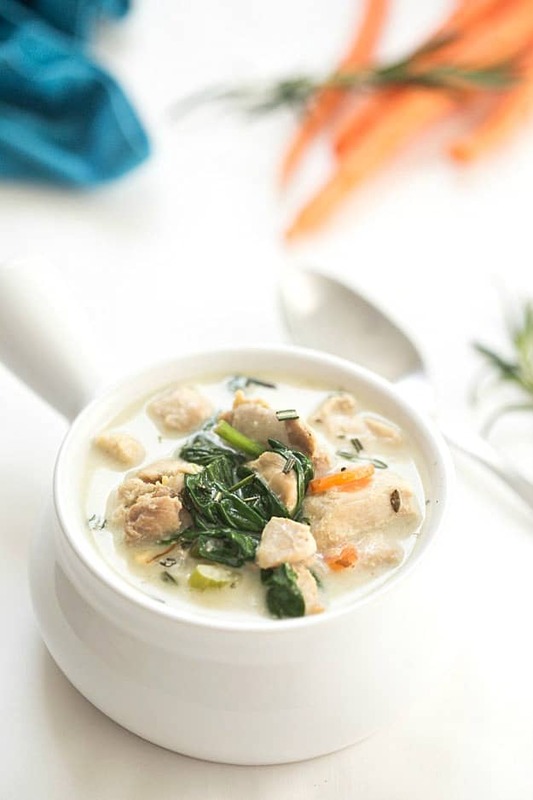 The rest of the ingredients are similar to a traditional bowl of this soup: Italian sausage, garlic, onion, chicken broth, kale, and heavy cream. Yes, you can still enjoy beef stroganoff on a ketogenic diet! Just take out the noodles that usually go in this dish and serve some veggies on the side. In addition to the steak, garlic, onion, and mushrooms, this recipe puts in some bacon, paprika, and tomato paste for added flavor. Do you have the need for cheese? If so, you’ll love this low carb recipe for the all-American Philly cheesesteak casserole. This has all the deliciousness you’d expect from a standard cheesesteak, except without those big loaves of bread. Choose either sliced or shredded meat and mix in all the traditional ingredients: garlic, onion, bell pepper, and, of course, loads of cheese! There’s nothing as refreshing as fresh-squeezed lemons in the summer. 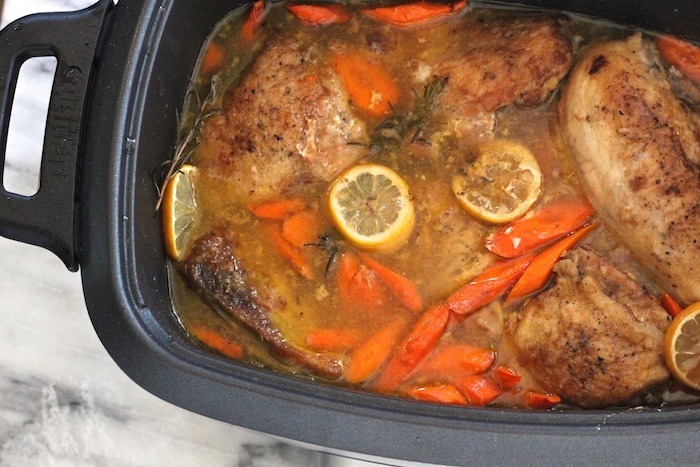 With this summertime chicken recipe, you could highlight the best of those bright citrus flavors using your crockpot. Mix your lemon juice with plenty of minced garlic, onion, and fresh rosemary. To add thickness to this broth, ignore the suggestion to use flour and instead use keto-friendly xanthan gum. 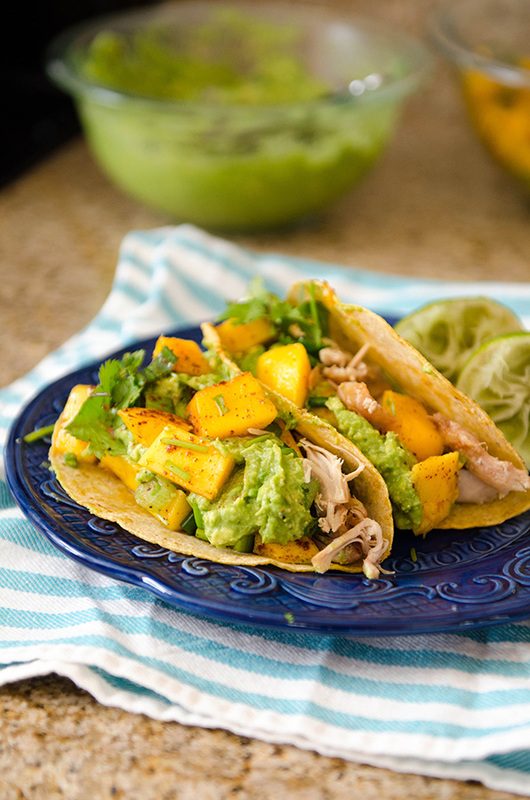 Here’s yet another wonderful citrusy chicken recipe you could whip up in the slow cooker. In contrast to the lemon-rosemary chicken, this chicken recipe has a spicier flavor thanks to the ground chipotle powder. If you don’t like too much heat, you could always opt for a milder chipotle powder. Be sure to have plenty of fresh cilantro on hand for an authentic Mexican topping. Let’s now move to Greece now for some culinary inspiration. 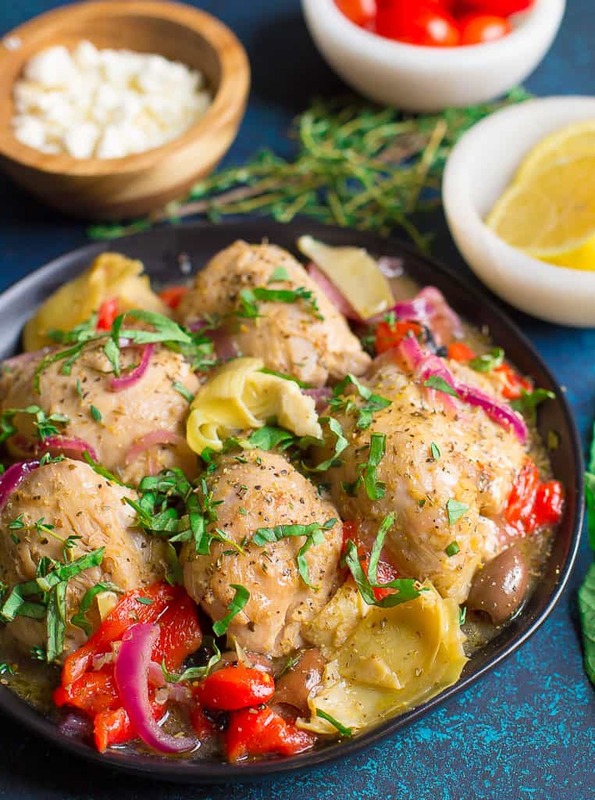 This crockpot chicken recipe is a perfect way to get the health benefits of the Mediterranean diet without all those whole grain carbs. Distinctive ingredients you’ll instantly pick up in this dish include kalamata olives, roasted red peppers, and artichoke hearts. For garnish, sprinkle feta cheese on top and mix in all of those famed Mediterranean herbs. Anyone craving some sizzling seafood should give these shrimp fajitas a try. All you have to do is mix bell peppers, a tomato, an onion, chicken broth, and seasonings in a crockpot and set it on low for about six hours. After those six hours are done, add the shrimp on high for about 30 minutes, and you’re done! To avoid the carbs, serve these fajitas on a bed of lettuce. Nowadays, there are dozens of questionable boxed curry mixes at the supermarket. Of course, it’s always best to make your curry at home not only for the perfect flavors, but also to ensure everything fits with your keto lifestyle. Luckily, this slow cooker recipe is both keto-approved and easy to make. So, get ready to bust out your curry powder, because it’s time for Indian tonight. There’s no simpler way to prepare a perfect Polynesian dinner than by following this recipe for crockpot Kalua chicken tacos. You only need three ingredients for this chicken: Hawaiian sea salt, liquid smoke, and chicken thighs. Although this is supposed to be served with a mango slaw, you could switch that with some guacamole if you want to avoid the fruit. Of course, just switch out the tortillas for lettuce to avoid the carbs. It seems like everyone nowadays is kale crazy. If you’re one of the thousands of fans of this nutrient-dense green, then this is the keto recipe for you. Combine your chopped kale with carrots, garlic, onion, turkey stock, and turkey meat. For a bit of freshness, add a few sprigs of rosemary for garnish. Anyone who’s not coo-coo for kale can substitute with spinach. 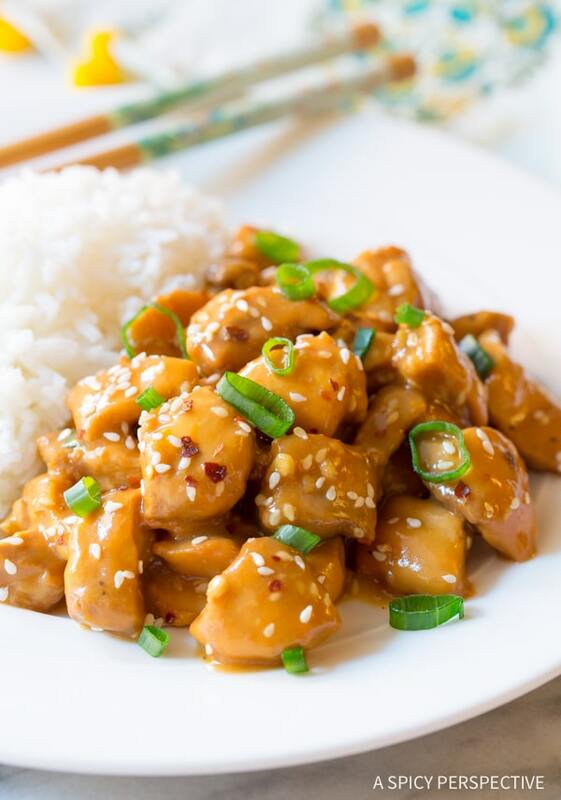 Instead of ordering Chinese take-out, why not prepare your own low carb orange chicken in the slow cooker? For a flour substitute, use the low carb arrowroot powder to give these chicken thighs thickness. Once your orange chicken is cooked through, consider serving on a bed of cauliflower rice. Here’s another classic Chinese recipe for people following the keto diet: slow cooker beef & broccoli. This dish, which uses flank steak as its protein, should take only about six hours to cook on low. If you want to skip the soy sauce, consider using liquid aminos. You could also add sweetness to this slow cooker meal with a bit of stevia rather than more traditional brown sugar. As you taste a bowl of this keto gumbo, you’ll instantly be transported way down South. You’ll notice this recipe uses chicken, shrimp, and sausage for protein, which makes it great for anyone who wants some surf & turf for dinner. For a thickening agent, use a little keto-friendly xanthan gum. You could add some richness (and plenty of collagen) to this dish by using chicken bone broth as a base. You could use either beef shank or beef short ribs in this mouth-watering Mexican shredded beef recipe. In addition to traditional spices like cumin and coriander, this recipe uses a bit of turmeric for anti-inflammatory benefits. You can serve this shredded beef in a variety of ways, but a few of the most popular methods include over a bed of veggies or on top of some homemade guacamole. It’s impossible even for the laziest chefs to mess up this creamy beef short rib crockpot recipe. 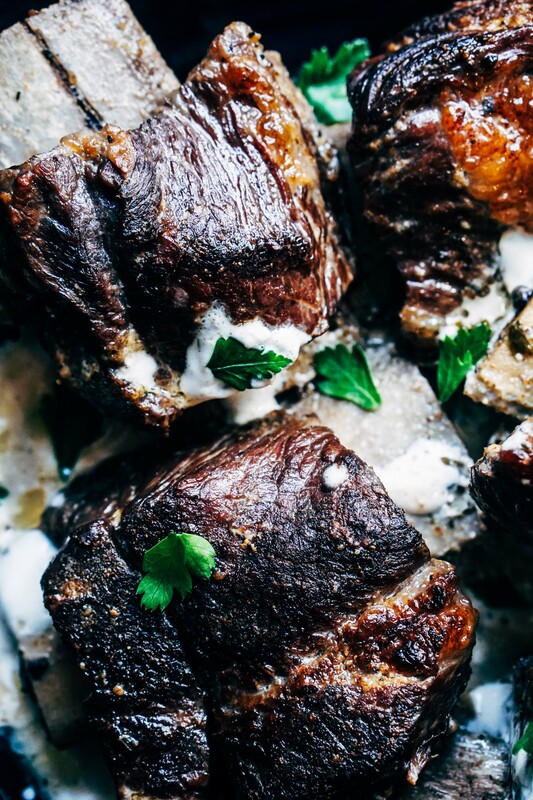 All you need are beef short ribs, cream cheese, beef broth, mushrooms, and garlic powder. Simply brown your beef, throw all the ingredients into a crockpot, season with salt & pepper, and let it sit on low for about seven hours. Yep, it’s really that simple! Lamb may not be popular in the USA, but it’s been used extensively in Middle Eastern and Mediterranean cuisine for centuries. One great way to add flavor to this lean red meat is by adding fresh mint. You can easily whip up a classic lamb & mint dish in the slow cooker by following this recipe. Add in garlic for added flavor and plenty of green beans for your veggie. This mashed cauliflower slow cooker recipe is a perfect idea for anyone who wants a super simple side dish to compliment their meat. In addition to the garlic and cauliflower, this recipe uses butter and Greek yogurt to add creamy-goodness. Put in some fresh chopped chives and rosemary, and you have yourself a wonderful low-carb side that’s ready in about three hours. Take an exotic voyage to North Africa with this Moroccan-inspired chicken dish. This dish is full of all the wonderful spices you’d expect from this region, including coriander, cinnamon, cumin, and ginger. This recipe includes apricots for a bit of sweetness, but you could omit them if you want to steer clear of fruits. Instead of couscous, make a keto-friendly “cauliflower couscous” to place under your chicken. Want to impress your keto friends for brunch? Check out this super-simple Mediterranean frittata recipe. There’s no need to be intimidated by the name “frittata;” just let your slow cooker work its magic! Place some arugula with a red onion, roasted red peppers, and some goat cheese in a slow cooker. Next, place a mixture of eggs and oregano on top and cooker on low for about three hours. Italian and Thai cuisines are quite distinct…but that doesn’t mean you can’t combine them in this simple zucchini lasagna dish. Using the zucchini as a replacement for pasta is a great way to reduce your carb intake. Some of the Thai elements in this dish include fish sauce, sriracha, rice vinegar, ginger, and coconut oil. For the Italian element, add plenty of ricotta, mozzarella, red pepper, and onion. Who says fine French cuisine has to be difficult to prepare? This slow cooker recipe for beef Bourguignon proves you don’t have to be an expert chef to pull off a classic French dish. First, just heat up your chuck roast in a saucepan; second, place the meat, liquids, veggies, and herbs in a crockpot on “high” and wait about six hours. Craving some juicy carnitas? 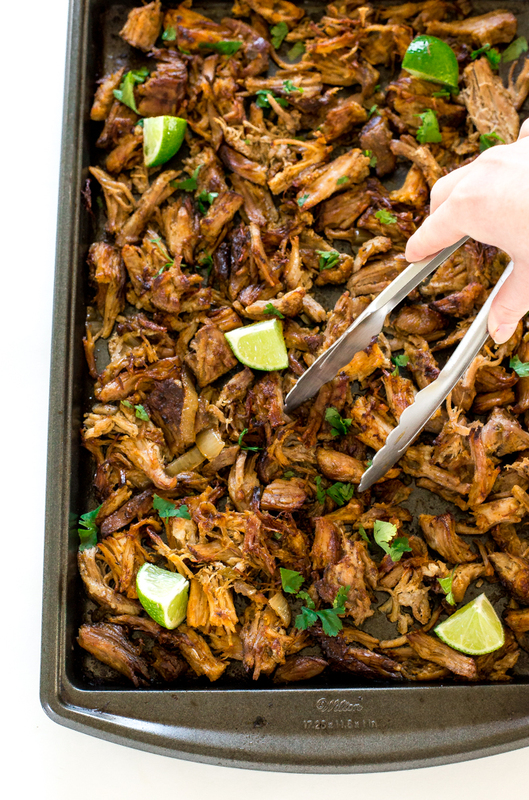 Then you need to print out this delicious slow cooker recipe for pork carnitas. Be sure to sear your pork well before putting them inside your crockpot with your other spices, peppers, garlic, and onion. Feel free to serve this seasoned pork over a crisp bed of lettuce. There’s no need for applesauce when serving this tangy pork tenderloin dish. Season your pork well with plenty of sage and cook with olive oil and chicken broth in your crockpot for about eight hours. While your tenderloin is getting tender, make the balsamic glaze with balsamic vinegar, pulsed blackberries, and olive oil. For a classy touch, serve your pork tenderloin with fresh blackberries on the side. Garlic, lemon, and chicken. Need we say more? Oh yes: add plenty of half & half! The brightness of the lemon is expertly complemented by the creamy half & half in this easy slow cooker recipe. You could have this Italian-inspired dinner done in only two hours with your slow cooker on high heat. 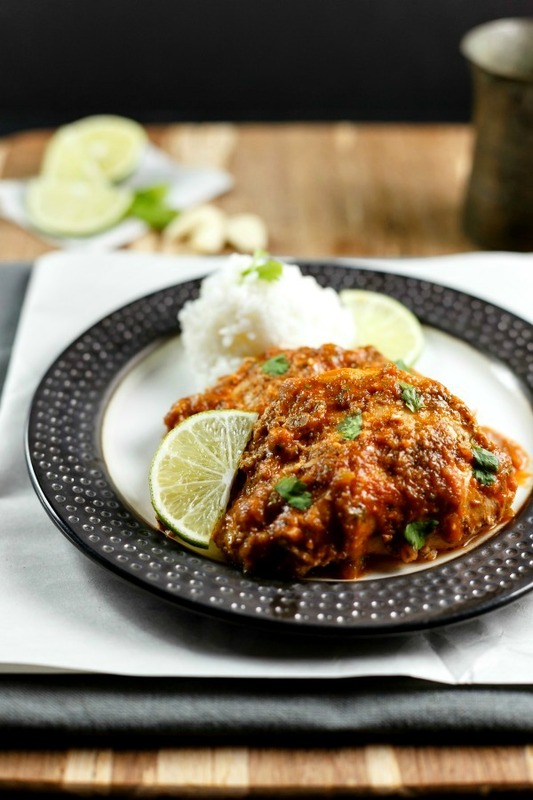 Enjoy the flavors of India without the carbs in this slow cooker keto chicken Tikka Masala recipe. This particular recipe uses guar gum to add thickness, but you could use xanthan gum if you’d prefer. For those who want to eat this as a main dish, prepare some cauliflower rice as a base. You could also serve this as a side or for lunch. Just because you’re on a keto diet doesn’t mean you can’t enjoy a dessert every now and again. 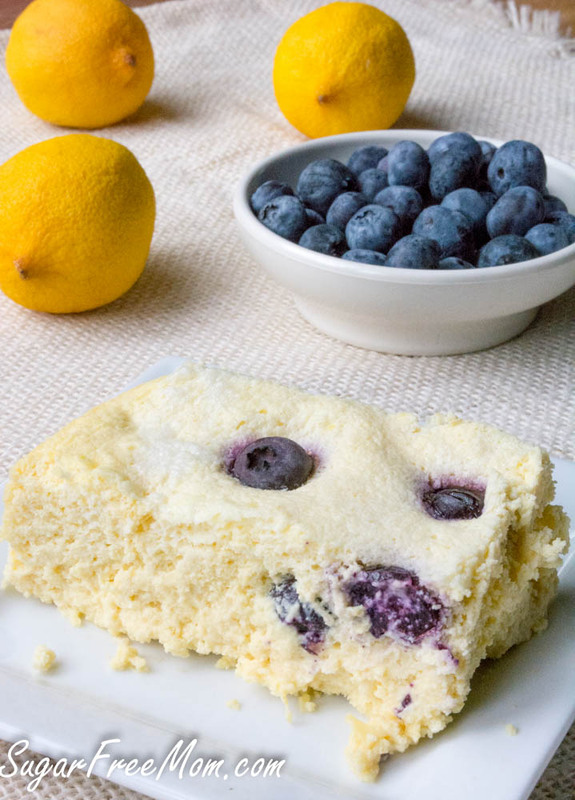 One of the easiest guilt-free desserts to cook in your crockpot is this blueberry lemon custard cake. Not only is this cake low-carb, but it’s also sugar-free thanks to the use of lemon stevia. As you can see, there are plenty of ways to bring bold flavors into your keto diet without spending all day slaving away in the kitchen. Each of these slow cooker recipes will help you maintain your low carb lifestyle with ease.